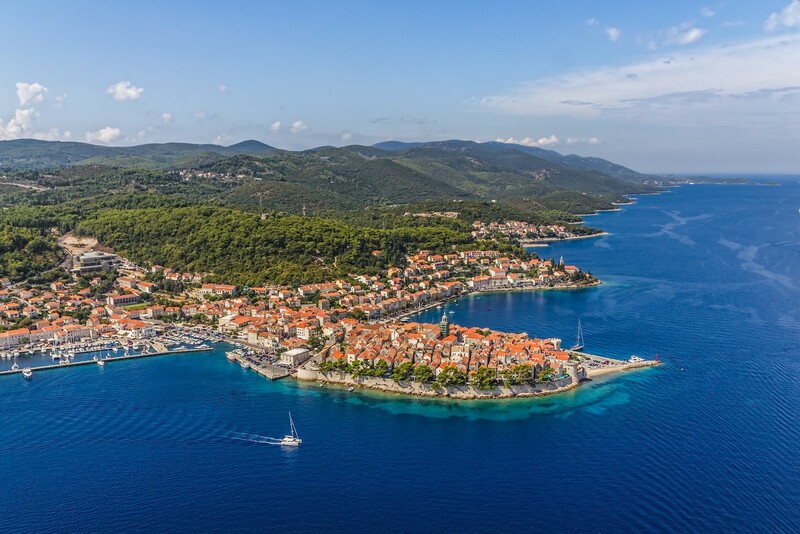 Like all Dalmatian islands, Korcula runs approximately from east to west. The eastern and western parts are low, while the central part is high. The highest point is Klupca (569 m). The island was extensively covered with forests until a terrible fire destroyed the entire central part of the island between the settlements of Blato and Smokvica in 1998. The main economic activities are agriculture, wine and fruit growing, fishing, fish processing, shipbuilding and tourism. 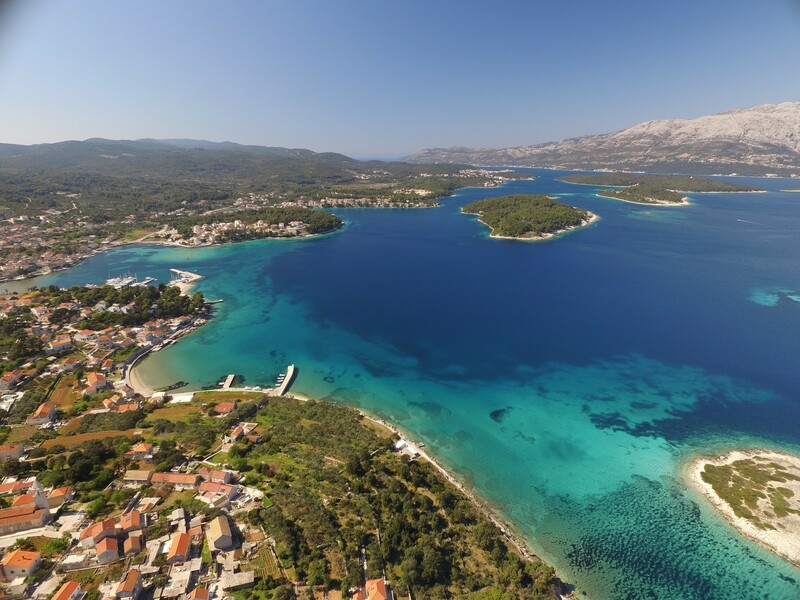 The coastal settlements include Lumbarda, Korcula, Racisce and Vela Luka, and those in the interior include Zrnovo, Pupnat, Cara, Smokvica and Blato. The settlements are linked by a regional road. 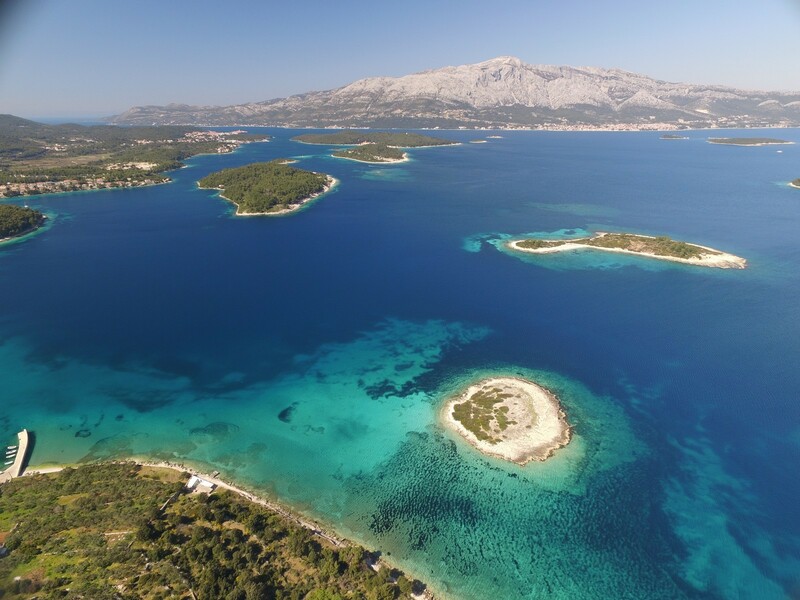 The island is connected with the mainland and other islands with the international Rijeka-Zadar-Split-Stari Grad-Korcula-Sobra-Dubrovnik-Bari ferry line and the local Split-Hvar-Vela Luka-Uble and Korcula - Orebic ferry lines. Tourism began to develop on Korcula later than on Hvar, and because restrictions were imposed at a later date, there are more industrial plants on this island. The winds blow strong everywhere around the island, but Korcula is nevertheless one of the most popular sailing destinations on the Adriatic. 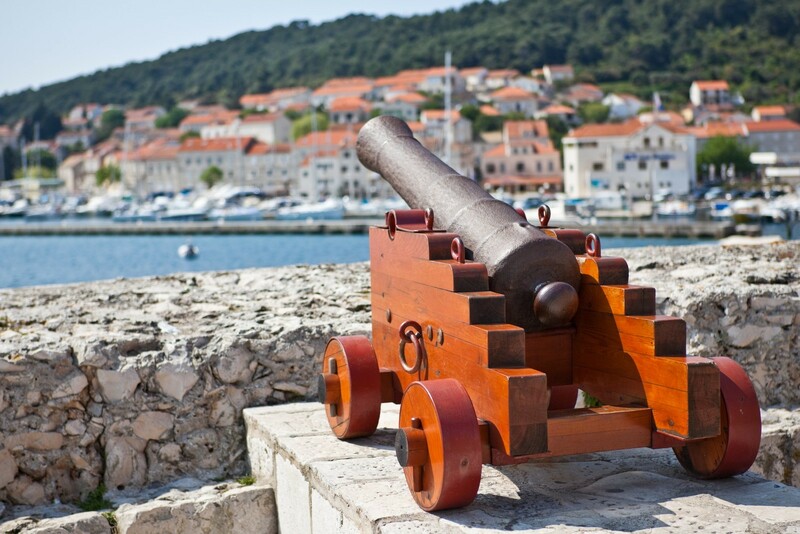 The island of Korcula was settled in the Neolithic period and in the Bronze Age. In the 5th and 6th centuries B.C. it was a Greek colony and the island was called Korkyra Melaina (Black Korcula). The Romans, who occupied the island in 35 B.C., retained the name (Corcyra Nigra). After the fall of the Roman Empire, the island came under Ostrogoth and later Byzantine rule. It continued to change hands until it became part of the Venetian Republic (1420-1798), but the island retained its autonomy. In the 14th century, it became famous for its quarries and stonemasons. The most famous quarries are situated on the islets of Kamenjak, Vrnik and Sutvara which lie off the eastern coast. The stonemasons of Korcula participated in the construction of numerous architectural monuments from Kotor to Venice. BLATO - This town in the interior of Korcula is the largest inland settlement on the Adriatic islands and the second largest settlement on the island. It lies on the eastern edge of the fertile Blatsko polje (Blato Plain), which was drained by diverting the water through a tunnel into the Bristva Bay. Blato is an important agricultural centre with an oil mill and a wine cellar. It features an over 1 km long linden tree colonnade and numerous societies and associations which strive to preserve traditional customs. The most famous custom is a traditional chivalric dance called Kumpanija, which is held on April 28, the feast day of St. Vincenza, the patron saint of the town. There are several private campsites in the town and its environs. The town surrounds the raised central square with the Parish Church of All Saints, which was completed in the 17th century. The altarpieces were painted on wood by Renaissance master Girolamo da Santacroce. On the square stands the Baroque town loggia from 1700. The oldest buildings are the cemetery Church of sv. Kriz (the Holy Cross) and the Church of sv. Jeronim (St. Jerome) from the 14th century. Blato's natural harbours include Prizba and Grscica on the southern side and Prigradica on the northern side. BRNA - A settlement on a bay of the same name on the southern coast of the island, which developed as the port of the settlement of Smokvica 4 km away. It is the largest port on the southern coast of the island. There is curative mud in the nearby Istruga Cove. The bay is divided into two parts by the Mali Zaglav Peninsula. There is an anchorage at a depth of 3 or 4 m in the western part, while the eastern part contains a quay with a depth of 4.5 m, a pier with a depth of 3 m and a launch ramp. Both arms are exposed only to southwesterly winds. 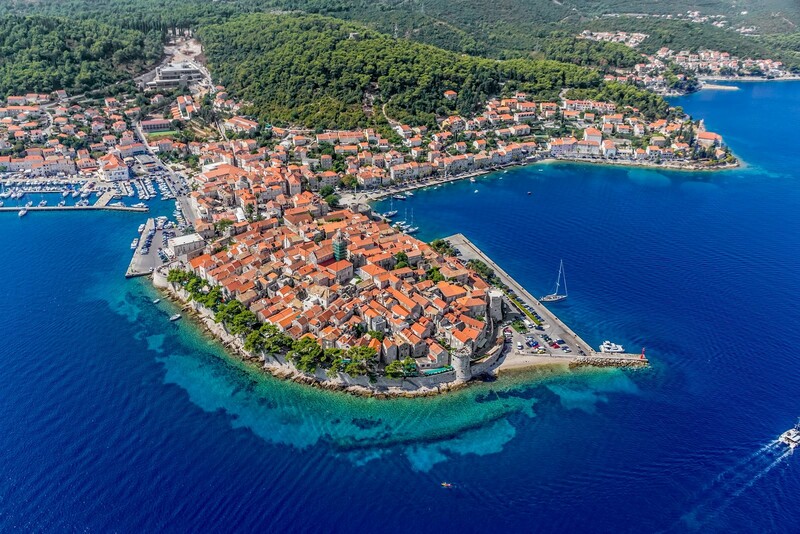 KORCULA TOWN - A town with a ferry landing on the Peljesac Channel on the northeastern coast of the island. It is a town with a rich cultural heritage and a long tradition of navigation, shipbuilding, stonecutting and stonemasonry. 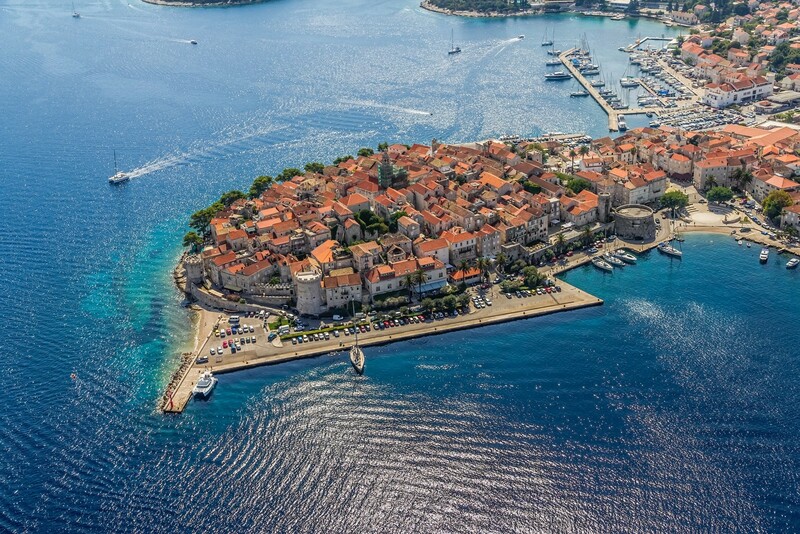 Korcula is one of the best preserved medieval towns in the Mediterranean and at the same time an important tourist centre with a hundred-year tradition of tourism and diverse accommodation and tourist facilities. 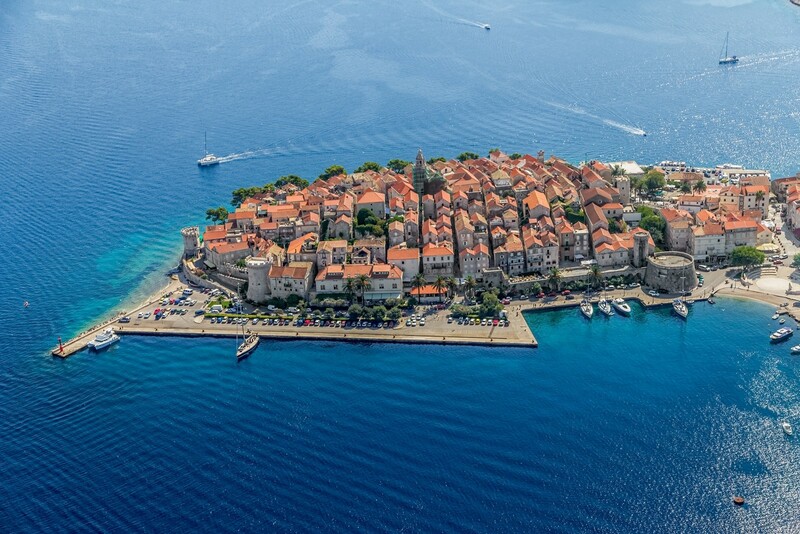 The plans for the construction of Korcula were designed in the second half of the 13th century, and a structured urban whole with a planned network of streets and squares began to be built. The town wall was also mentioned in the 13th century, but was later expanded several times. Of its towers, only Revelin (1493-96) with the mainland town gate (1650), Tiepolo (the end of the 15" century) on the northern side and Barbarigo (1488) on the western side in the harbour have been preserved. The town centre is dominated by the Cathedral of sv. Marko (St. Mark) with rich furnishings. It was completed at the end of the 12th century and was the seat of a diocese between 1300 and 1828. Next to the cathedral stands the former Bishop's Palace from the 17th century with a remarkable abbey treasury. Facing the cathedral is the Gabrielis Palace from the 16th century, which houses the Town Museum. The Town Hall (ground floor from 1525) and the Chapel of Our Lady, which was built in 1531 to commemorate the battle between the Venetians and the Aragonese which took place in front of Korcula in 1483, stand on a small square. The Dominican monastery with the Church of sv. Nikola (St. Nicholas) containing a collection of works of art stands on the western side of town. 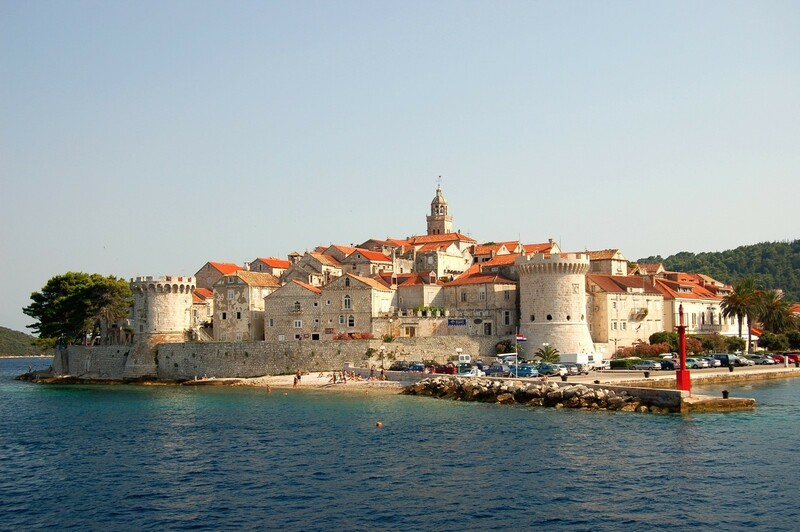 The famous traveller Marco Polo (1254-1324) was supposedly born in Korcula. The most attractive of the old customs is a chivalric dance called 'Moreska', which has been held on July 29, the feast day of St. Theodore, since the 15th century and nowadays even more frequently during the tourist season. The old town on a peninsula has two ports. The western port is exposed to northerly and northeasterly winds. Berths are available at a long quay. The eastern port is mainly used as a ferry landing serving the frequent line between Korcula and Orebic. There is a shipyard south of the port. Next to the quay lies a marina protected from the bora and the waves by a long pier. While the bay is undoubtedly beautiful, it does present certain dangers. During the summer, brief but violent storms occasionally come from the west, after the jugo has been blowing for two days. ACI Korcula Marina (020) 711 661, (020) 715 668 - There are 135 berths at a depth of 8 m, 15 spaces for dry storage, a repair shop, a 10-ton lift and a launch ramp. BADIJA - The largest and best-known island in the archipelago in the eastern part of the Peljesac Channel. For centuries it was run by monks who were particularly concerned with the preservation of vegetation. The former Franciscan monastery from the 15th and 16th centuries was transformed into a sports and recreational centre after 1960. There is a well-protected anchorage in front of the building. Boats can berth at a 20-m-long pier at a depth of 1.8 m.
BANJA - The fourth harbour of the town of Korcula lies in the Banja Bay. Berths are available at a few small piers at a depth of 2.5 m. There is an anchorage in the southwestern part. When entering the harbour, be mindful of the shoals. LUKA - The bay is exposed to northerly winds. Boats can berth in the harbor if there is space. There is an anchorage in the southern part of the bay, but the bottom does not provide a good grip in certain places. LUMBARDA - A very peaceful tourist town with charming old stone houses. The main economic activities are agriculture, wine growing (the Grk wine), fishing, stonemasonry and tourism. A local road connects it with the town of Korcula. The very rugged coast is lined with numerous sandy beaches. 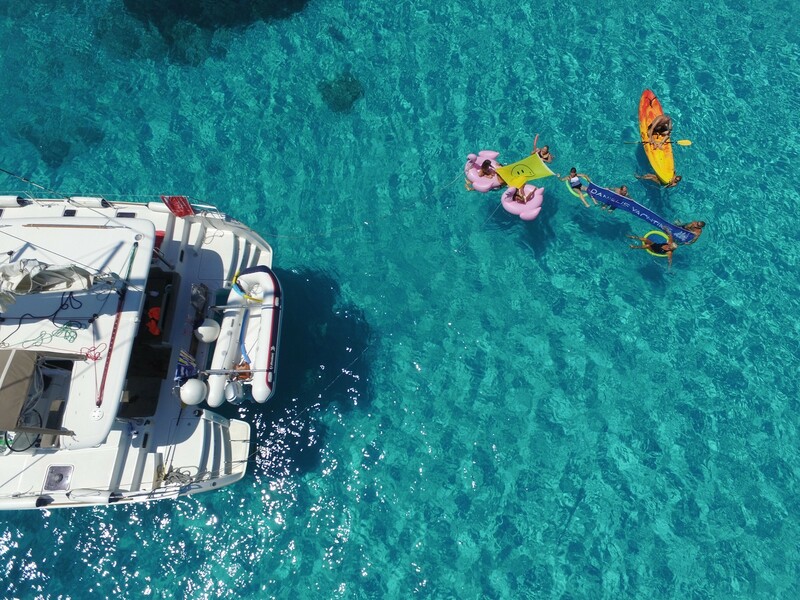 There are various accommodation and sports facilities, a small marina and a private campsite. Numerous traces of Greek-IIIyrian colonisation (stone inscriptions, earthenware, coins) have been discovered in the area. The most important of them is known as Lumbardska psefizma (the Lumbarda Psephism) and is a decree of the assembly of colonists on land distribution and the ensuing obligations, carved in stone. It probably dates back to the 3th century B.C. The town's attractions include the Parish Church of sv. Rok (St. Roch) from 1561 and a few summer mansions of the former Korcula nobility, which began to appear in the 15th century. The harbour is protected by a 50 m long breakwater and is occupied by local boats, so it is difficult to find a space for berthing. 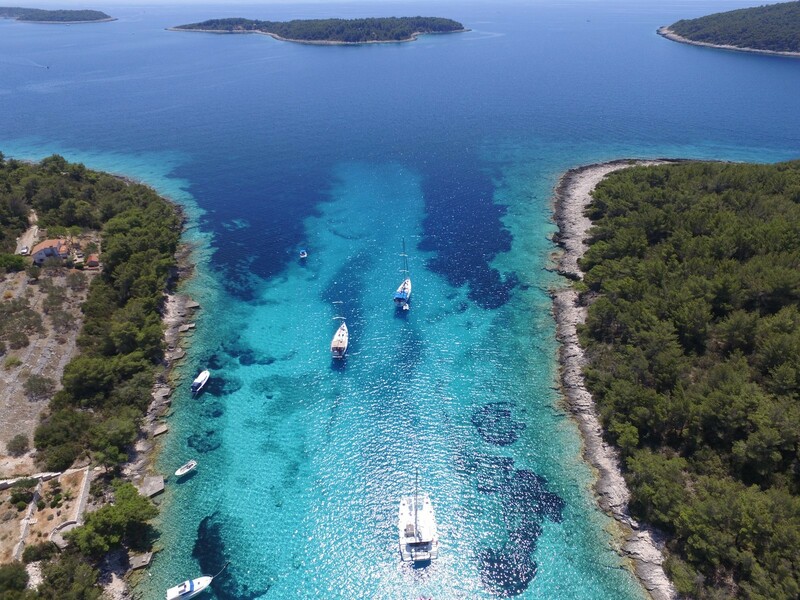 There is a good anchorage in the neighbouring Racisce Bay, which is protected from the winds by the islet of Vrnik. Lucica Lumbarda (020) 712 489 - There are 150 berths at a depth of up to 8 m.
VRNIK - An islet with a few stately stone houses. It is known for its high-quality white marble, which was used in the construction of many palaces in Dubrovnik, Venice and other towns, as well as parts of the Hagia Sophia in Istanbul and the White House in Washington D.C. Many excellent stonecutters came from this island. Quarries can also be found on the neighbouring islands of Kamenjak and Sutvari. The concrete harbour is reserved for local boats and tourist ships. Navigation around the islets requires great care due to shoals and reefs. PRIGRADICA - A hamlet on a bay of the same name on the northern side of the island north of A hamlet on a bay of the same name on the northern side of the island north of Blato. The harbor was built in the 19th century for the export of Blato products, particularly wine and olive oil. Prigradica is now a tourist town with various accommodation facilities and natural opportunities for sports. The harbor is protected by a breakwater with a depth of 4 m, but it does not provide a sufficient protection from northerly winds and the bora. There is a lift on the coast next to the breakwater. The harbor was built in the 19th century for the export of Blato products, particularly wine and olive oil. Prigradica is now a tourist town with various accommodation facilities and natural opportunities for sports. The harbor is protected by a breakwater with a depth of 4 m, but it does not provide a sufficient protection from northerly winds and the bora. There is a lift on the coast next to the breakwater. PRIZBA - A settlement on the southern side of the island on the local coastal road between Blato and Smokvica. There is a convent of the Sisters of Mercy in Prizba and a tourist settlement nearby. In front of the settlement lie several uninhabited islets which are attractive destinations for day trips and sports fishing. In front of the old part of the settlement extends the Ratak Peninsula, which provides protection from the jugo on one side, and from the maestral on the other. Boats can berth at a pier with a depth of 2 m. The bottom is rocky. PUPNAT - A settlement in the interior of the eastern part of the island. Ii lies on the regional island road in a valley between the hills anc is a starting point for hiking trips to Klupca (569 m), the highesl peak of the island, to the settlement of Racisce on the northern coast and to the hamlet of Pupnatska Luka on the southern coast. 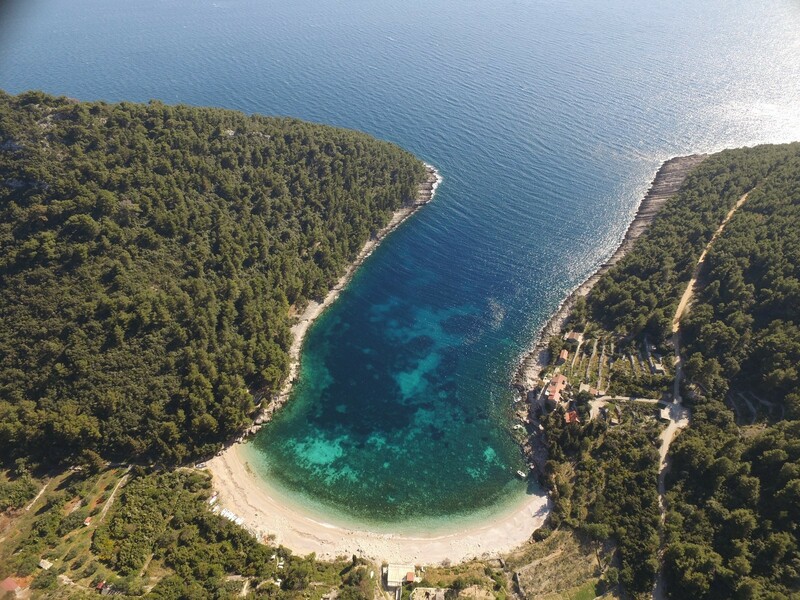 The inhabitants of Pupnat engage in agriculture and wine growing, and are the owners of the Kneza Bay on the Peljesac Channel, where they have built houses for tourists. The cemetery Church of sv. Juraj (St. George) was mentioned in 1383, and the three-aisle parish church was built after 1620. The Pupnatska Luka Bay with a few houses provides a good anchorage at depths between 8 and 10 m, and is exposed to southerly winds. RACISCE - A tourist settlement with a harbour on a bay on the northeastern coast of the island. 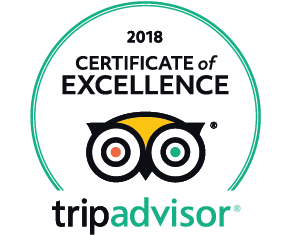 It is accessible by a local road from the town of Korcula. The main economic activities are agriculture, fishing and tourism with various accommodation facilities, including two private campsites. To the west lie the picturesque Vaja and Samograd Bays with beaches. Prehistoric remains have been discovered in a cave on the Samograd Bay. Racisce was established by refugees from the Makarska Riviera in the second half of the 17th century. In 1730 they were joined by refugees from southern Herzegovina. In the middle of the village stands the Baroque Parish Church of sv. Nikola (St. Nicholas). The harbour is protected by a breakwater with a depth of up to 3.5 m. There is an anchorage in the middle of the bay at a depth of around 6 m. When the northwesterly wind blows, the sea becomes choppy even behind the breakwater, and the anchorage is no longer safe. SMOKVICA - A settlement in the central part of the interior of Korcula on the regional island road. The economy is based on agriculture, wine growing (a large wine cellar), fruit and olive growing and olive processing. Smokvica is known for its Posip and Rukatac white wines. The parish church contains a loggia which is a remnant of an older church from the 17th century and in which the village chief and the judge held office. Smokvica has preserved a centuries-old chivalric sword dance called Kumpanija, which is frequently performed for tourists. Smokvica's harbor is Brna. VELA LUKA - An important tourist town with a ferry landing (Split, Hvar, Uble) on a rugged bay of the same name that cuts deep into the western coast of the island, where the regional island road ends. It is the largest settlement on the island. The main economic activities are agriculture, wine, olive and fruit growing, fishing, fish processing, food industry, shipbuilding (fibreglass yachts and sailboats) and tourism. There is an international maritime border crossing in the port. The town offers various accommodation facilities and facilities for sports and recreation. 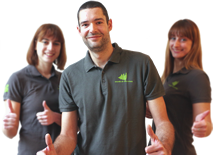 Dn the Kale Bay with its curative mud stands the modern Kalos health resort for medical rehabilitation. The Franulovic-Repak Palace houses the Town Museum. The coast is very rugged. The islet of Osjak with a protected forest park is a popular day-trip destination. Nearby lies the Vela spilja Cave, an archaeological site from the Neolithic period, but Vela Luka itself is a fairly young town. Until the end of the 18th century it was merely the anchorage of the settlement of Blato 4 km away, so there is no old town core. In 1978, its coastal part was heavily damaged by a tsunami, a giant wave that is caused by an underwater earthquake. Dn the Gradina Bay east of the town stand the Church of sv. Ivan (St. John), which was mentioned in the 15th century, and the ruins of a Benedictine monastery. In the southern arm of the bay lies the Greben Shipyard which offers repair services to sailors as well. Berths are available at pier with a depth of up to 4 m or at a 150 m long quay with a pth of 5 m. The bay is protected from the winds; only a strong easterly wind can cause waves. 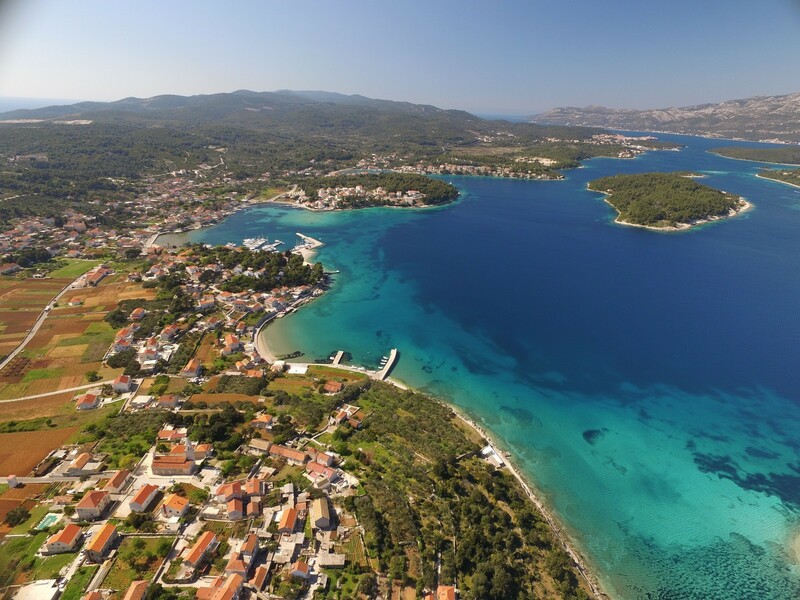 ZAVALATICA - A hamlet with the harbour of the settlement of Cara between the ivalatica and Zitna Bays on the southern coast of the island of Korcula. It is accessible by a local road. There are a few small ys with beaches nearby. The harbour is protected by a breakwater. Boats can berth at the ler side of the breakwater at a depth of 4 m or at a quay at a pth of 2 m. There is an inner harbour and a launch ramp at the d of the bay, which is exposed to southerly winds. ZRNOVO - A settlement in the interior of the eastern part of Korcula on the jional island road. Its inhabitants engage in agriculture, wine d olive growing and livestock breeding. Zrnovo consists of the mlets of Brdo, Prvo Selo, Kampus and Postrana. 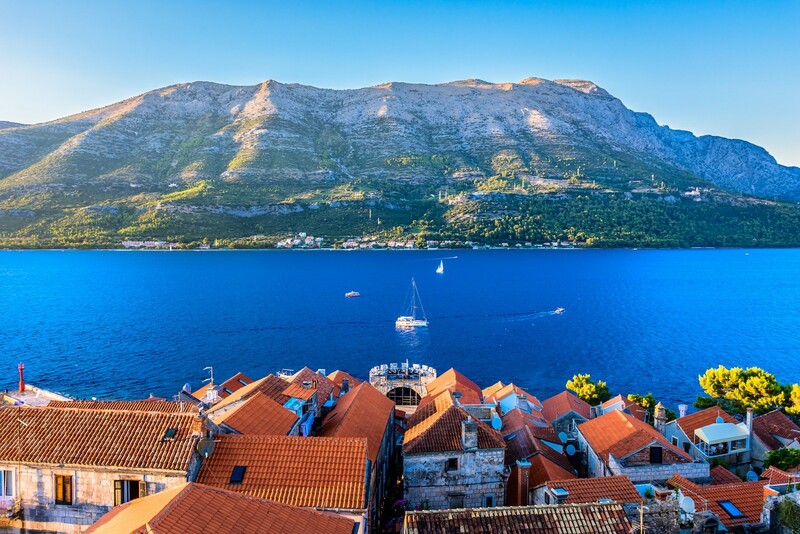 Families from novo built numerous tourist stone houses for rent in the bays along the Peljesac Channel, while the bays on the nearby south coast of the island are more inaccessible and ideal for those to desire privacy. There are a few private campsites in the set-ment. Near Zrnovo lies the protected area of Kocje with inter-ting geological features. The Church of sv. Vid (St. Vitus) was first mentioned in 1300. Parish Church of St. Martin from 1329 has been recon-ucted in the Baroque style and contains a gilded crucifix from 15th century. There are a few Baroque houses with inscriptions and coats of arms from the 17th and 18th centuries in the settlement.